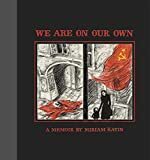 Miriam Katin's We Are on Our Own follows a Jewish mother and her daughter as they flee Budapest and the occupying Germans. After faking their deaths and leaving on foot, the pair find both kindness and terror as they seek safety, and eventually, their missing soldier husband (and father). Katin's understated drawings and simple storytelling pull the reader into her world, especially interesting since she was the child portrayed in the story. My next book is Buddha Volume 1: Kapilavastu, by Osamu Tezuka.